Are your shower screens impossible to clean? Our experts at Shazam Window Cleaning can restore them so that they look brand new again. And the best bit is that we then apply an invisible protective coating to keep them looking new for years to come! The protective coating we use is called EnduroShield® Protection for Glass and it is such a great product that it comes with a ten year guarantee. 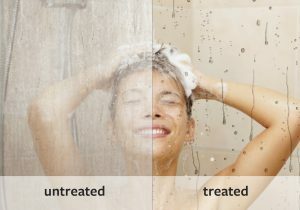 With EnduroShield® on your shower screens you will reduce your cleaning time by up to 90%. 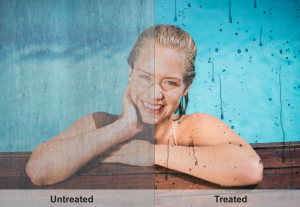 EnduroShield® repels water, soap scum and grime, allowing you easier cleaning less often! A regular wipe over with a mircrofibre cloth is all it takes, no more scrubbing. This amazing coating will protect your glass surfaces against deterioration from mineral deposits, shampoo chemicals, effects of soap scum, body fats, dirt, grime, lime scale and salt. Untreated glass is porous and as a result, it absorbs contaminants and pollution which cause deterioration and discolouration. The deterioration of the surface makes cleaning more frequent and more difficult. Once Shazam Window Cleaning has restored your glass through an intensive buffing and polishing process, our professional certified applicators will then use EnduroShield® to seal the porosity of the glass helping prevent the deterioration caused by etching and corrosion. As a result, the time and frequency of cleaning the glass is reduced. Pool Fences and Glass Balustrades can be protected too! EnduroShield® for Glass is a permanent non-stick, protective coating for use on all glass surfaces – so you can have you pool fences and glass balustrades protected as well. The once only application makes dirt and grime easier to clean by up to 90%. It will also protect against corrosion and etching caused by contaminants including sea salt, bird droppings and pollution. EnduroShield® continues to be specified by leading architects for application on both residential and commercial developments to protect the glass surfaces and reduce maintenance time for clients. Accelerated testing of glass with an EnduroShield® coating has been undertaken with exposure to alternating cycles of UV light and condensation. Results show minimal or no change in the product’s efficiency. As EnduroShield® creates a permanent non-stick coating which greatly reduces the time spent cleaning; maintenance costs can be reduced. EnduroShield® also protects the glass from staining and etching, eliminating the need for expensive glass restoration or replacement of panels. Our staff are fully trained and have received certification in the glass restoration process and application of EnduroShield® so you can rest assured that everything will be done to the highest of industry standards. Ready to experience our superior glass restoration and application of EnduroShield® Protection for Glass? Call 0414 820 986 today or send us an email to request a free, no-obligation quote.